Part of my plan for this year in turning our abode's spaces into more eye pleasing rooms is to make some colorful items that will add some much needed pizazz. That will include some pillows, table runners and a few wall hangings. 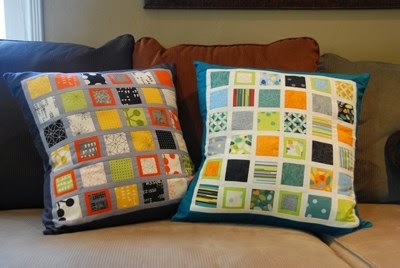 As I wanted a quick and easy project, I elected to follow someone else's pattern for my first pillow making endeavour. 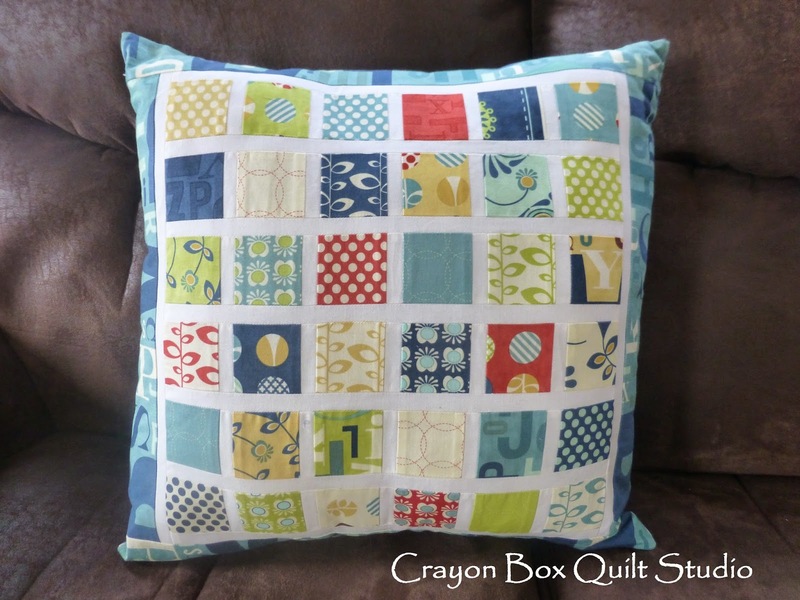 I ended up choosing this Mini Charm Pillow tutorial by Sam Hunter on Janome's website. I really like the small amounts of solid fabric around each square to break up the prints a bit. Right before the holidays I stitched up my first pair of pillows. Our playroom/library needed some oomph and I found the Social Club line by Eric and Julie Comstock for Moda the perfect choice and the blue color a great match for the room's curtains and the back of the new bookcases. Here is my result. I chose not to make the frames mini blocks that Sam did and instead just sashed each mini charm in a layout that I liked. 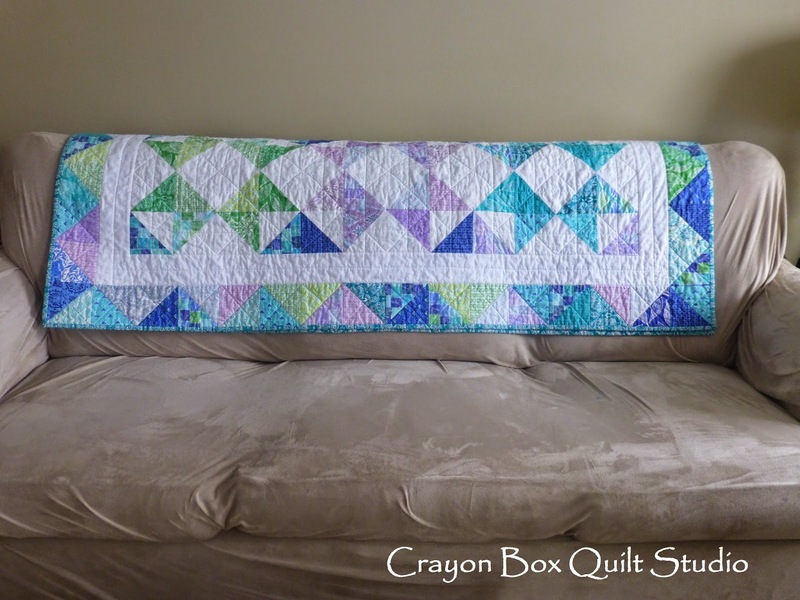 I used Kona Snow for the sashing as it is what I had on hand and I was able to find some of the Blue/Teal alphabet print for the border. I didn't copy the layout of the 1st pillow exactly for the 2nd one and that ended up being the right decision. I like the way they compliment each other instead of being identical. 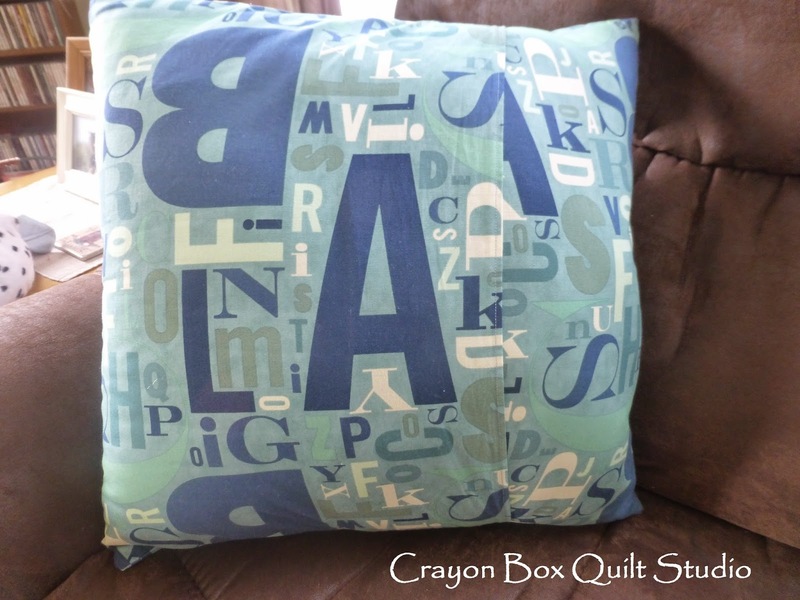 The envelope back was easy and I used the same alphabet print fabric. 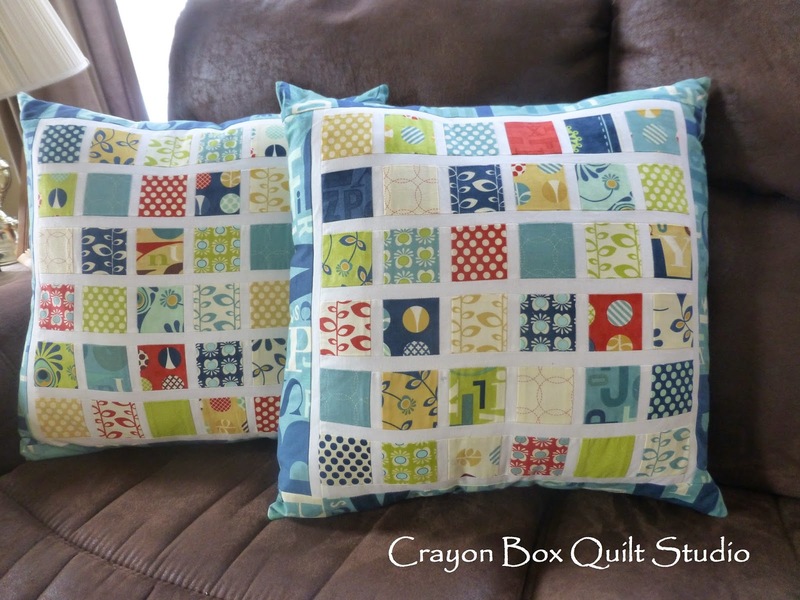 Like Sam, I like puffy pillows so these finished at 19" square and I stuffed a 20" pillow form inside. Here they are on the older couch in the playroom/library. 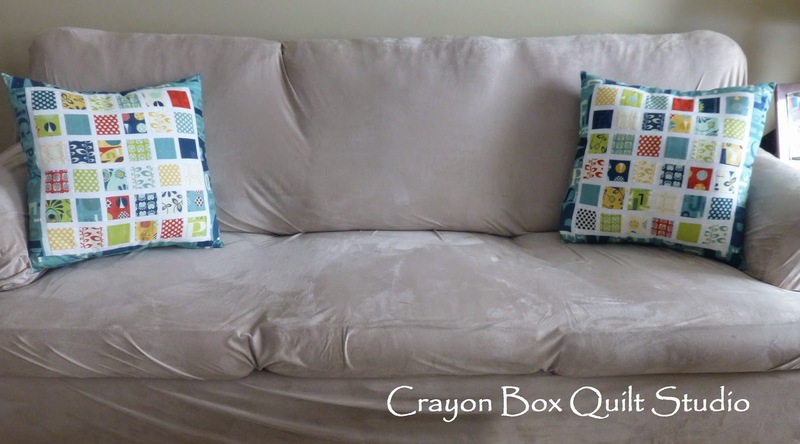 I'm not going to show you the fabric on the couch underneath the slipcover but let me just say that it really isn't my style anymore. 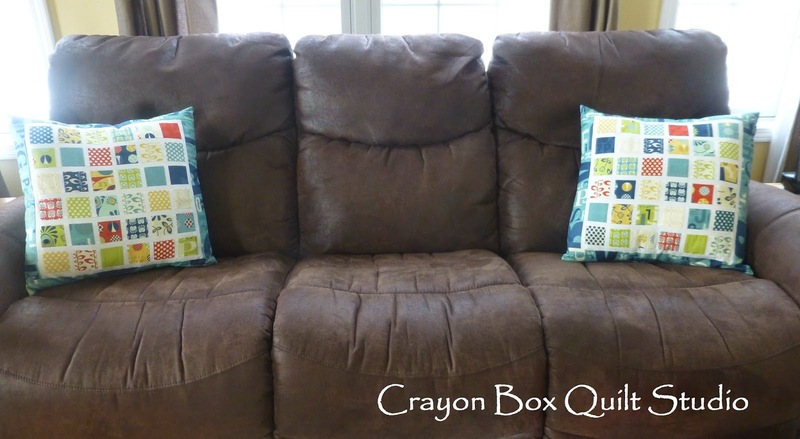 But this couch was major expensive when we bought it, it still is really comfy and lots of years of use left in it plus it has an honest and truly awesome queen sleeper inside that comes in handy the occasional times we have house guests. Now that the holiday decor is packed up and put away until next year., this couch turned out to the the best new home for my Castles on the Horizon quilt. The great colors really liven up this space a ton. So where did the Social Club pillows end up? On the new couch in our great room of course. I've never put any pillow on this couch before and as it turns out, my crew really like them there. The kidlets both had one snuggled on their laps Saturday night as they were watching a bit of tv. lovely pillows! I want to make some now! Your pillows are gorgeous...a breath of fresh air. Well done! What a great punch of color! They are so fresh and fun! 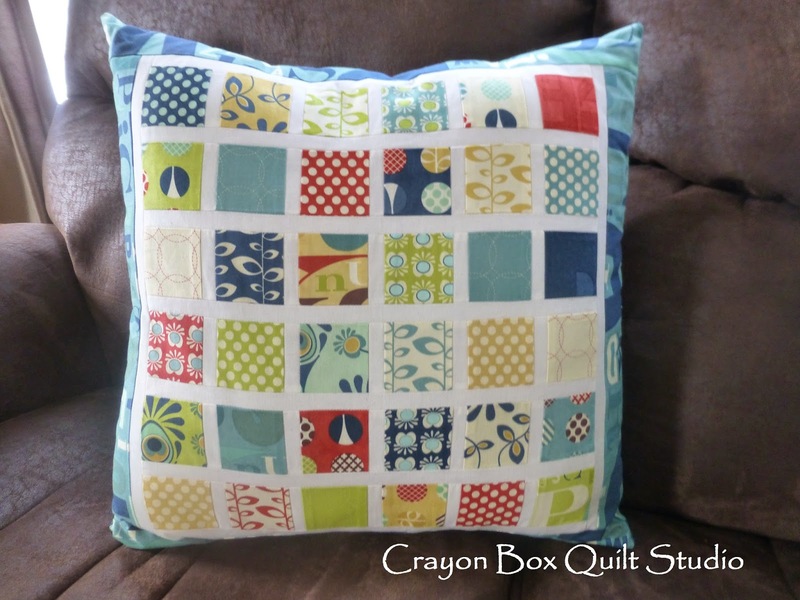 Love your backing fabric, too! They are pretty no matter which couch they are on. Lovely finish. Beautiful breathe of fresh Spring air...love them!! !